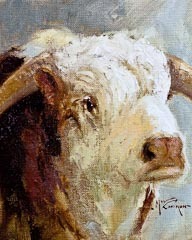 We were gathering bulls to sell to a rodeo contractor and had about reached our time limit for the delivery date. We split up forces in order to cover more country and to make another stab at several we had missed on previous attempts. I was delegated to go get old Sharp Horn who lived in a place we call “Rock Pile Trap”. Mr. Sharp Horn’s home fit the name, except it wasn’t a trap anymore, the fences were bad and the bull went any where he wanted to go in order to make a get away. I took all my bull gathering tools: a big horse, long rope, heavy chaps, brush jacket, two pistols, a dozen dogs and all the determination I had. I was surprised to find Sharp Horn so fast after getting a good early start. Usually the hardest part is finding the bull you’re looking for but this time we were way ahead of the game and I was already planning an early dinner. I hadn’t rode more than about a mile down a creek bottom looking for signs, when the dogs caught wind of him and were off to make a formal greeting. It didn’t take long for the puppies to get him held up and chew on him for a while. I let them have him for fifteen minutes or so until I was sure that he would remember them next time because I was sure he was going to make several runs trying to get away. I called the dogs off after the big bull quit fighting so hard and to let him think a minute while I watched and tried to come up with a plan on how to get him to the Ojo Bonito Pens. The pens were a couple miles away with lots of rough country covered in thick brush and cat claw. This is ideal country for a bull who doesn’t like to be bothered. It was fairly easy for the dogs to work in but pure hell on horses and certainly not very cowboy friendly. I was letting the dogs breathe while mulling over a plan when Mr. Sharp Horn made his move and tried to run smooth over me. My horse “Chewy” was not asleep and got out of the way as Mr. Sharp Horn went zooming past us headed to his next hidey-hole. It didn’t take much encouragement for the dogs to get in hot pursuit and they soon shut him down again. As soon as the bull stopped to fight I called the dogs off and when I approached him I let him move off as long as he walked off but the minute he started to trot or run I let the dogs have him again. It wasn’t long before Mr. Sharp Horn figured out that if he walked he could go anywhere he wanted to go and I wouldn’t let the dogs harm him. This was the first step but it wasn’t enough to convince him to go through the gate at the corrals. So my next step was to teach him to herd from the sides as well as he did from behind. This was basically the same theory except I didn’t use the dogs unless he ran off. All I did was to move to his sides and when he looked away, I turned away also and rode in the opposite direction for a short distance. Then I’d turn and follow him for a short distance. I would repeat this exercise on the opposite side until he was comfortable letting me herd him around the trap. This would have been sufficient with most bulls, but I knew from past experience that this old renegade was not going to allow me to herd him away from his precious home into a set of corrals. I decided another disciplinary measure would be worthwhile. I felt that more dog maneuvers would be helpful. So I taught the bull to follow me while the dogs brought up the rear. This is called wearing in the dog handling world. It wasn’t long after this exercise that the bull got real comfortable with me, mainly because of the dogs. The bull learned that I was the one that could keep the dogs off of him. So I just rode all over the country getting the bull used to following me and leaving his sacred home territory. I still had enough time left to get the bull penned and hauled to headquarters in order to meet the truck….well I’d hoped I did anyway. It was late afternoon when we headed to the corrals and I had been breaking the news to him slowly by riding fairly close to the corrals which were well out of his home territory. He was fairly comfortable with the situation so off we went to see if all our preparation was not in vain. The country around the corrals was fairly flat but covered with thick catclaw and you couldn’t see the corrals until you were nearly in them. We were still about a half mile from the corrals when old Mr. Sharp Horn heard voices from a couple of the men who were also headed to the corrals. You couldn’t see them, but in the still of desert country, voices travel well. When Mr. Sharp Horn heard the enemy he dropped like a wild deer. He dropped so quickly that his left horn was inches off the ground and between my horses front and back legs with his eyes closed and both ears laying flat on the ground. I couldn’t believe it and the dogs were looking at me like I did something to the bull and my horse Chewy was frozen in his tracks not knowing what to do next. I have never seen an animal react in this manner while in a human’s space. I had seen lots of cattle drop to the ground in order to hide from someone but never had I ever seen one drop while they were already in human company-mine! I realized that he was hiding from the voices he heard but I wasn’t sure what his next move was going to be and I wasn’t sure of my next move either. So we just all stopped and waited. I went from pure amazement to nearly a giggle and the dogs were as stupefied as I was. We were all froze while we waited for the voices to get out of hearing distance and I had time to analyze this situation a little. After the surprise wore off, I realized that I wasn’t included in the enemy forces and the old bull considered me a friend. This amazed me even more, and I realized how delicate this situation was and I sure didn’t want to make any mistakes now. We were too close to the corrals and completing the project. I didn’t want to mess up all the work and preparation I’d done so far but I couldn’t keep from getting a little tickled thinking about a picture of this on the cover of Western Horseman. While I was fantasizing my romantic situation, the voices had moved out of range and Mr. Bull had opened his eyes and was looking around. He made sure that the coast was clear and then just stood up right next to me completely relaxed. I asked him if he was ready to go now and we took off at a leisurely walk. I was on top of the world and I could see me from now on with an eighteen hundred pound tiger striped bull with four feet of sharp horn as my own personal bodyguard. Nobody had a pet like this one but as with all dreams, this one was to end also. We continued on to the corrals and everything was wonderful until we were going down this narrow trail and I had to move to the drag position as the trail was too narrow for both of us to walk down side by side. We were coming up on the corral gate but Sharp Horn couldn’t see it until he was right up on top of it and I knew this would be another huge fear factor. Sure enough, when he saw the gate he stopped and started surveying the situation from the ground up to the over-brace then to the water lot inside and I could see him getting mad all over. He swelled up until he looked like a blimp in the trail and turned around and looked at me like I was the sorriest, no good traitor he had ever seen and here he came, head down and blowing steam! He looked like a runaway D8K Caterpillar dozer coming down the hill so thinking was out of the question! My instincts and reactions were short on time and the distance was barely long enough for me to get my 45 long colt out, scream “HEY BULL” and fire twice right in front of his charge with the shots throwing gravel and dirt all over his face. Chewy didn’t have any room to operate in this thick cat claw and we were stuck. I thought we were steam rolled when the bull threw his head up and looked at me in total shock. He had a look on his face like, WOW I DIDN’T KNOW YOU HAD A GUN! He stopped, turned around slowly, and walked into the corrals while I stood and watched him. Here again, in total amazement on my part and this is where all my previous endeavors paid off. He walked across the water lot and looked around and I walked in the corral and shut the gate. About this time my friends showed up and I thought it was best to get my bull in the smaller pen before I had too much help to confuse the situation. They got the truck and trailer while I got the bull moved to the smaller crowding pen with the loading chute. Mr. Sharp Horn was very thoughtful until we backed the trailer into position and asked him to get in the trailer. This is when I thought we didn’t have enough pens which were made of two inch steel pipe, welded and buried in post holes filled with cement. The big bull hit these pipes and tried to jump out until he was exhausted. I thought we were going to miss the truck at headquarters since it took so long to load him but finally, in he went. Once inside, he started to tear up the trailer with all his hooking and kicking antics. All of this is without any provoking from us and I was sure glad to get moving, hoping this would settle him down. I was getting more confident about getting to headquarters the closer we got and by the time we arrived I was sure we had just gathered the bucking bull of the year. Here again, however, very seldom are our balloons ever bullet proof. When we got there, the truck driver was closing the doors on the trailer and the rodeo contractor was ready to pull off. I jumped out and went to pleading my case about not leaving me with this bull as I was afraid he would carry a grudge and I was convinced I would never be able to sweet talk him into doing anything ever again. Old Mr. Sharp Horn was still mad in the trailer and I was trying to convince the rodeo contractor that this was the best rodeo bull prospect we had ever gathered. The rodeo man wasn’t very convinced by my argument but he reluctantly allowed us to load our bull on the truck. That same rodeo contractor came back the following year for some more bulls and told me that I didn’t know much about bucking bulls. He said old Sharp Horn fought everything that moved and jumped out of every arena they put him in but he never once bucked a jump and the safest place around him was on him! Comments for "Mr. Sharp Horn"
Stephen Jones on January 03, 2011 Only a “true hand” could of written such a story. I really enjoyed it and my friends will too. Thanks Mike and Happy New Year to you and yours. 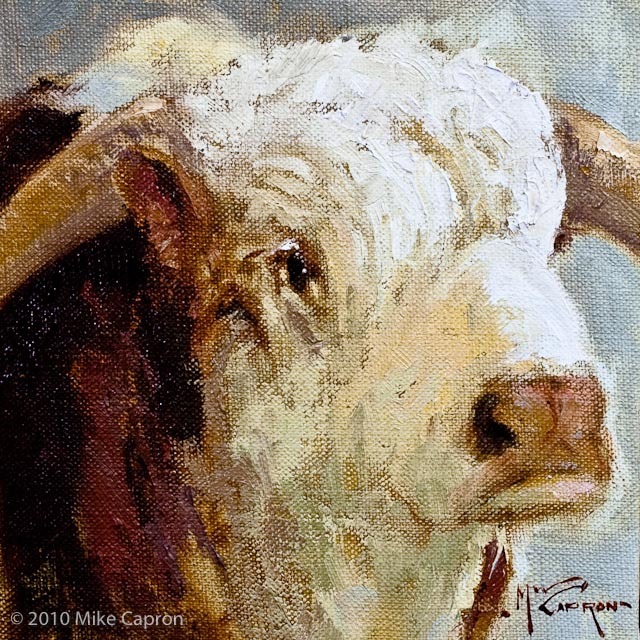 Carol Williamson on January 03, 2011 I remember a bull you tied to a tree when you, Dow and Lonnie gathered the wild eyes on Chico ~ Dad was cooking for ya’ll that week. Phyllis Gentry on January 04, 2011 Enjoyed it as usual. Always look forward to your stories. Wishing you and your family a Happy and Prosperous New Year. Mike Capron on January 05, 2011 Thanks Stephen for enjoying the article and I really appreciated your comments as it always takes a true hand to know one and I know you certainly are an experienced bullrider and would appreciate the rest of the story about getting some good bucking bulls to the Rodeo. Mike Capron on January 05, 2011 Thank you Carol and Phyllis for sharing your thoughts on the article, sure brings back memories of good times. That is another good story Carol of gathering bulls on the Chico.